Guest post written by Michael T, a self proclaimed “geek” with a passion for amateur radio and scanner listening. Oh, you can add guest posting to that list now. I have always been a scanner radio listener, but I never thought my phone would satisfy this part of my inner-geek. I was wrong. 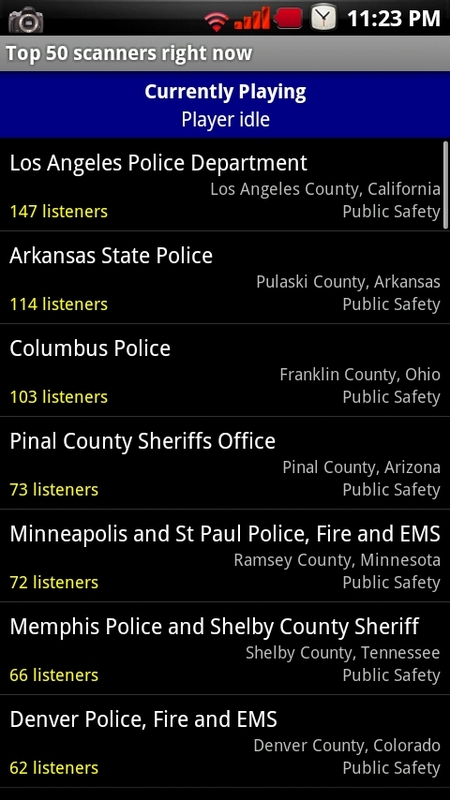 If you want to hear police radio chatter, there are few apps for that. However, Scanner Radio stands out because of its simplicity and speed. I can listen to the police in my hometown of 35,000 people in the middle of desert. If you’d like to hear something besides police, you can browse by genre, area or source. You can also search by location (menu or GPS). It’s important to note that the developer doesn’t control what frequencies you can hear, this is a function of the sources. 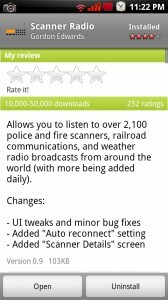 Currently Scanner Radio features feeds from LiveFireFeeds.com, RadioReference.com, RailroadRadio.net and Wunderground.com. So, asking for the developer to add the “Mayberry Sherriff” won’t help. Sorry, no Andy Griffith. Still, the list of available frequencies (over 2,100) is quite impressive. You can listen to the Fire Department in Roswell, NM, the LAPD and many places in between. This is a young app, and updates arrive every couple of days or so. Unlike many app updates though, there seems to be something new with each update. I am told by the developer that there will be an option to remove ads and the capability to add custom audio streams in the future. If you like some of the other scanner apps, I highly recommend giving this one a try. If you’ve never listened in on America’s Finest, give it a try.